The teacher looked around her classroom. It was littered with paper, plastic kits, and sweet wrappers. How could her class generate so much waste! The earth was already reeling under the onslaught of mountains of garbage. She feared for the future of these little ones who would suffer for no fault of theirs. “Teacher, teacher, tell us a story today”, came a chorus from cheerful faces. “What about our Geography lesson?” asked the teacher. “We have so many days to learn. We come to school till March,” reminded a naughty boy. “Yes, yes, he’s right” shouted the others. She smiled at the eager innocent faces and said ‘‘Ok, little friends, listen carefully “and began her tale. Once upon a time, the skies were the deepest blue, the trees and plants were the richest green, the waters were sparkling crystal clear and the air was scented with the intoxicating seasonal blooms. The leaves on the trees would dance in delight, the plants would clasp one another in joy and the waters would prance in glee as the naughty wind flitted playfully around and a warm glow would spread across the brilliant sky. When the sun set, the sky came alive with the lustre of millions of twinkling stars and, while the world slept peacefully under the watchful gaze of the moon (who did slumber now and then), the owls and mice played hide and seek and the fireflies enjoyed their game of ‘guess where am I’ in the stillness of the night. Men and animals were the best of friends, diligently learning lessons taught by Mother Nature. Together they toiled all day long to make the earth richer and at night they rested well. But as the Earth revolved steadily around the Sun, the other planets, far and near, felt envious of the pleasures they were deprived of. “It is always very hot here” complained Mercury who was staying next to the Sun. “I am even hotter” cried Venus, “you see me shine bright every morning and evening, but the heat is killing me.” “What about me? I am close to earth and we are so similar, yet no one comes here. Why?” shouted Mars, turning red with anger. “Hey…I am the largest among you, so much land lying barren here and it becomes very lonely, so don’t you grumble,” thundered Jupiter. 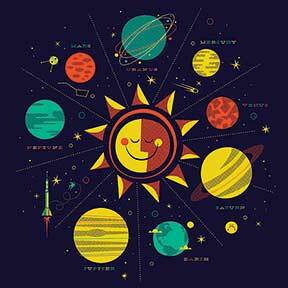 “Astronomers call me the most beautiful planet” said Saturn smiling arrogantly, “and I am happy the way I am. The Earth can never be as lovely as me”. Uranus and Neptune who lived very far wished they too could have a glimpse of Earth, the much talked about beautiful blue planet. They all revolved around the Sun hoping and waiting to blemish the charm of the Earth. “Not at all” was the reply. Jupiter and Mars hurried to gather all the seeds they could find and freed the meteorite who, in gratitude, sped away to deliver it to the earth. “How will the seeds harm the Earth?” asked Mars. ‘Well, I have added certain elements in it that will increase the intelligence of men and help in creating materials which men will use more and more and gradually choke the Earth to death” replied Jupiter with a satisfied smile. Mars was shocked and protested. “I do feel jealous but I will not allow you to wipe out the Earth”. “The seeds are on their way, dear Mars, and there is nothing you can do,” quipped Jupiter. The seeds of greed started to slowly sprout and bear fruit on the Earth. Men and animals became the worst of enemies. Man forgot to rest and toiled away. Day and night appeared to be equally bright. The fireflies lost their glow and could not play anymore. The owls and mice could no longer hide. The twinkling stars grew pale at what they saw. The sky watched in dismay. The trees and plants found it hard to sway and smile, choked by the plastic weeds. The waters, heavy with the junk thrown by men could no longer leap with the wild wind. The poisonous air crushed the fragrance of the seasonal blooms. The children heard the story in pin-drop silence. They looked at each other. Without a word they bent down, picked up the rubbish strewn around and put it into the waste basket. “Teacher, we will make the Earth happy once again. We promise we will work to end its suffering” said the smallest of them with tears in his eyes. They assembled around their teacher who cuddled them to her. She felt comforted and thought ‘all is not lost’. Sujata Unnikrishnan teaches social studies at Vidyodaya School, Thevakkal, Kochi. She is a voracious reader, loves quizzing, listening to music and enjoys indoor games. She can be reached at sujauk9@yahoo.com.